The Hawaii volcano has been actively erupting since early May, but experts think it could continue for much, much longer. The U.S. Geological Survey’s Hawaii Volcano Observatory said that Kilauea has already covered approximately 12 square miles in lava, and broadened the island’s surface by some 700 acres. While the volcano has technically considered “erupting” since 1983, the last few months represent an explosive—and dangerous—escalation. Given this volume and the sustained withdrawal of magma from the summit reservoir without appreciable deformation in the lower East Rift Zone, it is most likely that the LERZ eruption may continue for months to years. 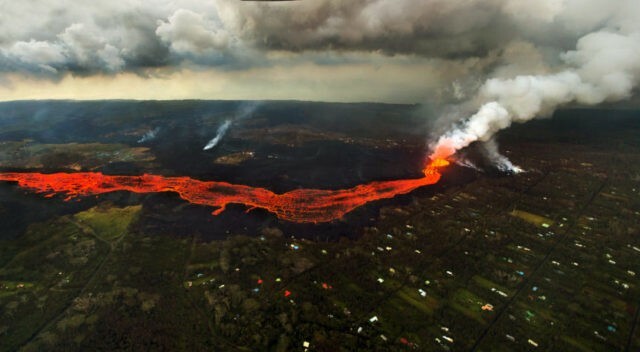 Dozens of fissures have torn the surface of Hawaii’s “big island,” the most vicious of which is Fissure 8. The fissure continues to pump molten rock from the depths at about 100 cub meters per second from the Leilani Estates to the ocean, and has shown no sign of slowing. Their report has been passed on to the Hawaii County Civil Defense in preparation for any further complications. For now, it looks as if the volcanoes that created the Hawaiian islands may have ambitious plans for their expansion.